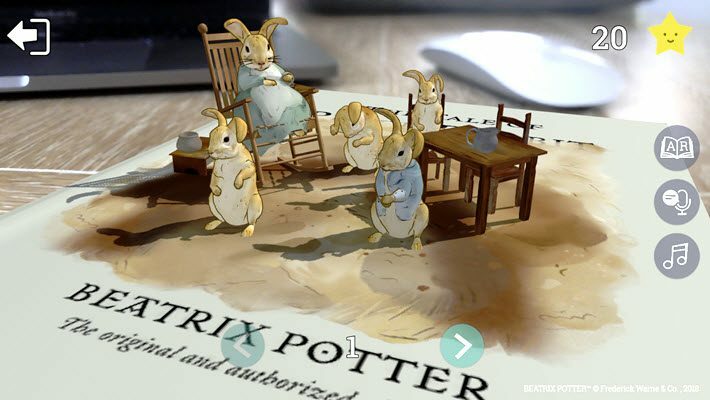 Going to market today, Inception’s Bookful app has the advantage of the beloved Beatrix Potter content and other Penguin Random House brands on which to base its first six bookish AR offerings. The immersive entertainment company Inception, which works in augmented and virtual reality, has announced today (November 7) that it has a licensing arrangement with Penguin Ventures to develop treatments of some of Penguin Random House’s front- and backlist titles. The marquee content selected for the announcement is PRH’s Beatrix Potter material, The Tale of Peter Rabbit, The Tale of Jemima Puddle-Duck, and The Tale of Benjamin Bunny. The content is housed and presented at Bookful, an iOS app available at the App Store or at this site. Bookful is being opened to the public today. Using the camera in your device, the app makes three-dimensional animated figures appear over from the books’ illustrations—similar to the Pokemon Go effect. An informational video, complete with celeste music and firm instructions, describes the approach and how to use the app. For the two-year-old Inception—which has offices in Tel Aviv, London, and New York City—the PRH brand licensing agreement is a chance to roll out an AR-based offering with classic content that parents may recognize and trust. Rather than having to sell both the technique and the content, nostalgia may well do the content-sales job for the young company. Bookful is a new point of concentration in AR for Inception, which has previously focused on its cross-platform VR app, which the company reports has had more than 1 million downloads since October 2016. The Bookful app is a free download, with in-app purchases to follow. No mention has been found in media materials about an Android edition. An interesting element of the Bookful offering is that no purchase of a physical book is required. The content is entirely rendered in the app, and in one of its two modes, the user can select to have the text of the book read aloud; turning off this option allows the user to read the text in a virtual book for her- or himself. The “read” mode is described by the company in its media messaging as featuring “a digital version of the book with illustrations that come to life throughout the story.” It’s in this mode that the user swipes the pages of a virtual book, as an evocation of reading a hardcover edition with its illustrations standing up on the pages and moving. The “play” mode features “activities in which children can interact with characters from each book.” Interaction introduces a star reward system, which suggests in-app loyalty program elements ahead. Inception’s two-path explication of the material for Bookful in AR isn’t unlike the direction taken by augmented reality specialist Ariel Galit, who spoke in a Publishing Perspectives Talk at Frankfurter Buchmesse. Galit’s book about AR is Augmenting Alice: The Future of Identity, Experience and Reality (BIS Publishers, 2017). Much as what Galit is describing, the Inception approach includes audio—music, voice, and sound effects. And as in many cases of AR, what sometimes comes to mind is the old ViewMaster technique which rendered Disney characters and other illustrations in an approximation of 3D as seen through a stereoscopic viewer. 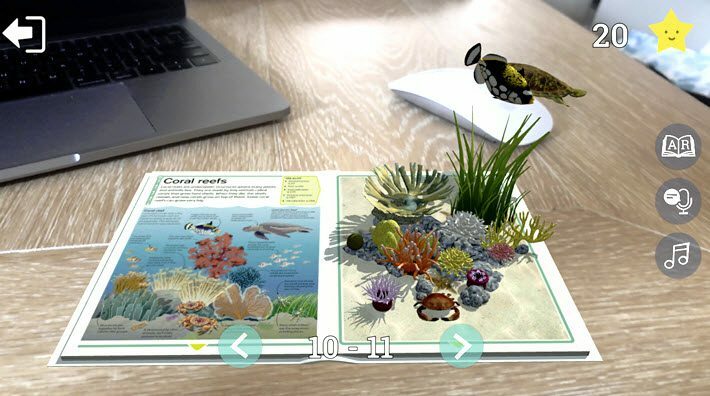 In a prepared statement, Benny Arbel, Inception’s CEO, is quoted, saying, “Bringing books to life through augmented reality provides opportunities to get all children excited about books, whether they enjoy reading or not. Like the question of whether audiobooks’ popularity is encouraging reading—or just listening—the interactive elements of a “play” mode do reintroduce questions of whether “gamification” helps build a habit of reading in children. When the text can be read by a voice to the user and the experience of a book can be that of a gentle (“Find me the cucumbers!”) veggie patch hunt, are we drawing young consumers to reading? Or to playing? Are we teaching them the art of long-form narrative focus? Or are we entertaining them with adorable floppy-eared play? Are we selling them a book? Or a game? Such considerations may arise late this month when Inception’s Bookful is one of five book-related startups vying at the Bookseller’s annual FutureBook conference in London—now “FutureBook Live”—for the BookTech Startup of the Year award. 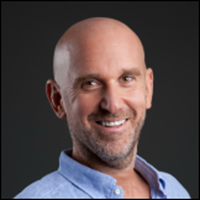 This is the yearly session in which the chosen shortlisters make their pitches to jurors, and you can find FutureBook editor Molly Flatt writing about it here in her pre-conference Q&A with Arbel. In that exchange, Arbel mentions one of the points that can seem to some a potential difficulty, harkening back to experiments in “enhanced ebooks,” which proved for many publishers to be too time-consuming and expensive to produce. Arbel mentions to Flatt that Bookful has “the largest collection of AR experiences that we’ve seen in one place” as it launches–and that, of course, is six titles. Some of the questions of user effectiveness that will come into play as the new app approaches the marketplace, then, will include how readily children will return to one or more of the titles in the app. If they enjoy but then discard each title quickly, how fast can the Inception team license and develop new titles? Consumer uptake on the new app remains to be seen, and the real (and welcome) test here is whether some of the best-loved content can be translated into a popular augmented product. As yet, AR hasn’t stormed the marketplace, although many efforts have been made. It’s good to have another opportunity to watch hopping across the children’s books arena. More from Publishing Perspectives on augmented reality is here, and on children’s books is here.